Conservation buffers in citrus groves can have native or planted vegetation established which aid in receiving any potentially hazardous residues or runoff, filtering them before they reach the surrounding area. In order not to compromise their purpose, growers refrain from agrichemical or other treatments in these buffers. Regular inspections, rejuvenations, and maintenance of buffers are performed to maintain their integrity. The Florida Forest Service assists in prescribed burns for these areas to aid controlling native and invasive vegetation. GROVE BORDERS CAN ENCOMPASS THE GROVE with permanently planted or natural vegetation, such as rows of trees that serve as wind breaks. The function of these borders that surround the grove is to reduce wind and water erosion, guard soil and water quality, and provide shelter to wildlife habitats. The primary objective of a grove border depends on the neighboring role of land and environmental sensitivity. Other types of buffers include FILTER STRIPS and RIPARIAN BUFFERS, which each have their ideal application and purpose in the grove. The Florida Aquifer is the major underground source of water for the state. Citrus growers help protect this precious resource through carefully guarding and caring for wellheads. Growers determine well location, construction, and proper management while being conscientious of the surrounding environment. They prevent contamination of wells with precise compliance to regulatory requirements, common sense measures, affective well placement, and careful agricultural management around wells. The “Squeeze” on Florida’s Citrus History: In the mid-1500s one of the early Spanish explorers, most likely Ponce de Leon, planted the first orange trees around St. Augustine, Florida. Florida’s unique sandy soil and subtropical climate proved to be ideal for growing the seeds that the early settlers planted and have flourished ever since. Today it is a $9 billion industry, employing nearly 76,000 Floridians. Protecting natural water resources like the wetlands, springs, and streams is one of the ways citrus growers are leaders in conservation. The Water Management District’s (WMDs) legislative mandate and U.S. Army Corps of Engineers (COE) regulates direct impacts on wetlands, as well as monitoring secondary and cumulative impacts. Growers carefully control non-point source water pollution (NPS) and minimize pollutant discharges that occur from water runoff, leaching, and seepage to surface waters. In order to protect Florida’s natural water resources, the BMPs that citrus growers undertake include vegetative buffers used near wetlands, riparian buffers for streams, non-fertilized vegetative buffers for first and second magnitude spring recharge basins, and preventing backflow with proper maintenance and construction for well operations and protection. Citrus groves serve as recharge areas for the aquifer helping replenish water to these natural sources. The Wastewater Division Innovative Reuse System for citrus irrigation utilizes rapid infiltration basin reuse (RIBs). Reclaimed water from wastewater treatment plants from urban areas is treated and disinfected to mandated levels. Then, once deemed safe it is reclaimed for beneficial purposes, termed “water reuse.” Water recycling is integral and a natural occurrence through the hydrologic cycle. Citrus operations can apply reuse water when irrigation requirements are high and soil moisture is low. Both RIBs and citrus irrigation recharge the aquifer. Florida leads the country in reuse programs and was the first recipient of the U.S. Environmental Protection Agency Water Efficiency Leader Award in 2006. The key benefit of water reuse for environmental conservation is fresh water recharge. The reuse programs effectively help the agricultural community with dependable water supply, possible reduction of fertilizer applications (since reclaimed water has nutrients present), and lower energy costs. 725 million gallons per day (mgd) of water is reclaimed for beneficial purposes in Florida. 14,056 acres of citrus operations irrigate with water reuse, which is filtered through their healthy sandy soils of citrus, thus recharging the aquifer. Water reuse management is an effective means of conserving ecosystems in citrus operations. The most common uses of reclaimed water flow are public access (55 percent), industrial uses (17 percent), groundwater recharge (13 percent), agricultural irrigation (10 percent), as well as wetlands and other uses (5 percent). The Florida Department of Environmental Protection (FDEP) regulates the edible crops usage of reclaimed water for beneficial purposes. Requirements include that the crops be thermally processed, or, peeled, skinned, or cooked. Studies have shown no negative impact of water reuse for irrigating citrus groves and have shown improvement of fruit quality and abundance, benefiting groves. With studies ongoing, water reuse contains preexisting levels of nutrients and fertilizers, in which could offset fertilization and nutrient replacement for some citrus operations. History, climate, geography, and environmental forces have jointly created a singular and significant reservoir of horticultural, landscape, with diversity in plant and animal species of Florida’s ecosystems. Citrus buffers help to support this delicate balance of plant and wildlife systems. Citrus groves are often part of Wildlife Corridors because they connect natural habitats. Wildlife may safely and easily move through groves. Animals often need to be able to migrate to different natural areas to survive over time and citrus groves play a role in facilitating this movement. Diverse plant species that grow around groves provide shelter, resting areas, and food sources for natural and protected Florida birds, mammals, amphibians, and reptiles. Insectivorous birds and birds of prey that commonly live on groves help to control insects and rodent populations that threaten or damage citrus crops. Snakes also reduce vertebrate crop pests. 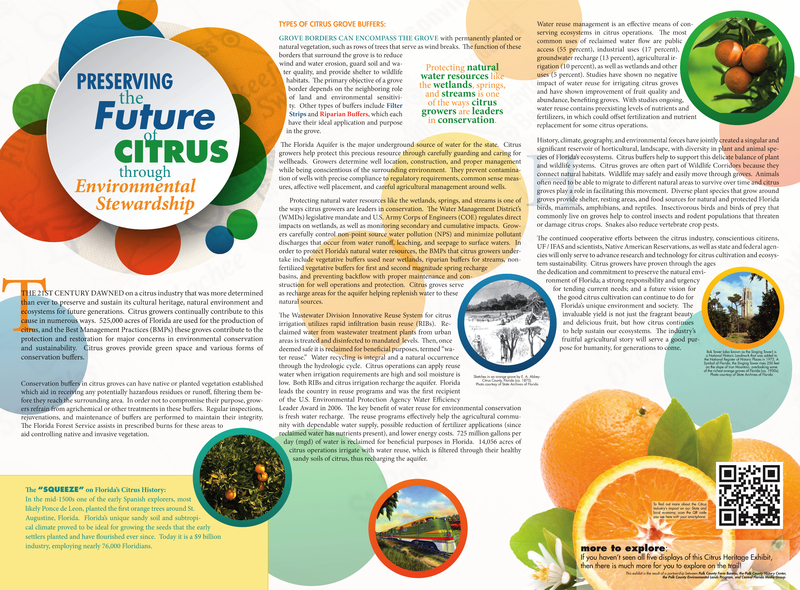 The continued cooperative efforts between the citrus industry, conscientious citizens, UF / IFAS and scientists, Native American Reservations, as well as state and federal agencies will only serve to advance research and technology for citrus cultivation and ecosystem sustainability. Citrus growers have proven through the ages the dedication and commitment to preserve the natural environment of Florida; a strong responsibility and urgency for tending current needs; and a future vision for the good citrus cultivation can continue to do for Florida’s unique environment and society. The invaluable yield is not just the fragrant beauty and delicious fruit, but how citrus continues to help sustain our ecosystems. The industry’s fruitful agricultural story will serve a good purpose for humanity, for generations to come.